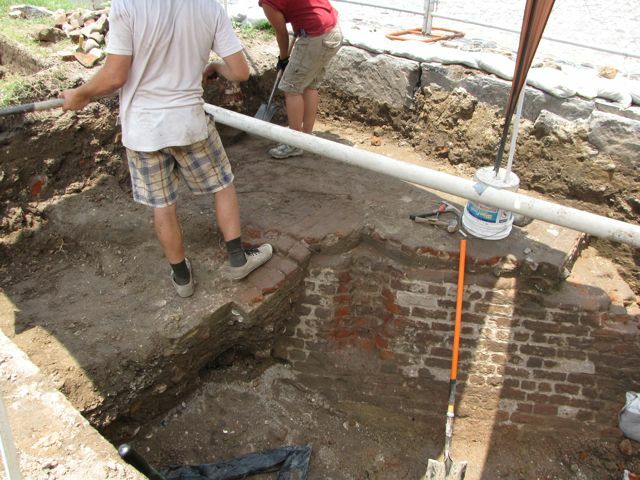 The dig at the east end of Tradd Street had a slightly larger audience today thanks to Robert Behre’s latest article, “Charleston Dig Reveals Tip of History,” in today’s edition of the Post and Courier. Later in the day the local ABC affiliate, WCIV News 4, arrived and interviewed your truly. Meanwhile, back in the trenches, students continued to excavate the soil adjacent to the south face of the redan. That work is now moving at a slower pace, however, because we’re just above the water table and the soil is becoming increasingly damp. Simultaneously, a few feet to the west, students continued to remove the earth situated above the redan and opened a connection with a separate unit to the west (see below left). 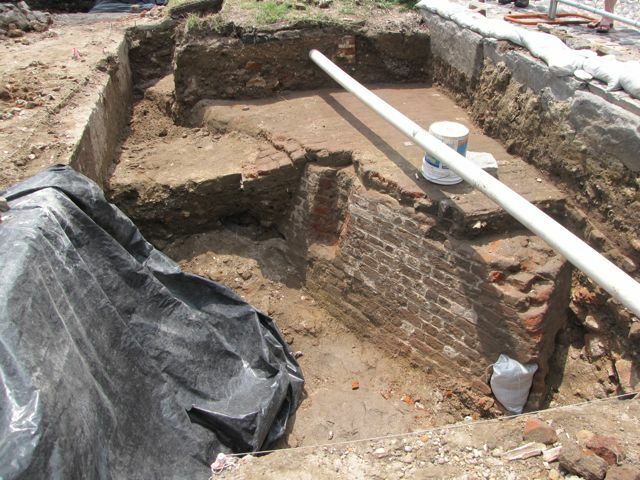 The profiles in that area have now been studied and photographed, so tomorrow they’ll begin removing the remnants of the Lower Market floor and the soil blocking our view of the redan’s south face (see below center). By the end of this week we’ll be able to see a continuous redan wall measuring nearly twenty feet. The earth removed from the area adjacent to the redan continues to yield interesting artifacts. 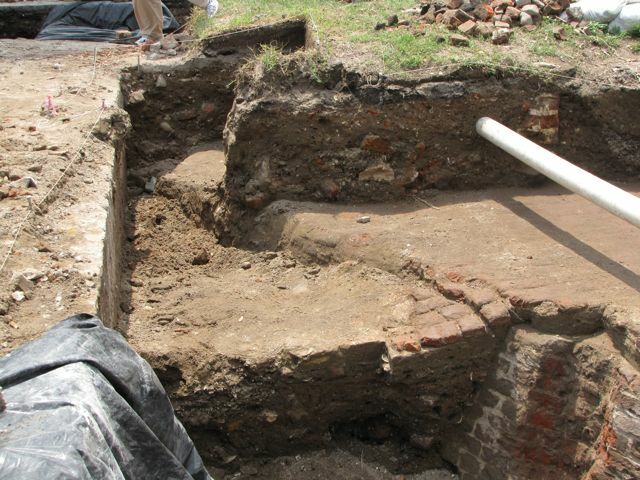 One of the most common sights in this soil is broken brick fragments (brick bats) that rained into the mud when the upper parts of the redan were demolished in the mid-1780s. 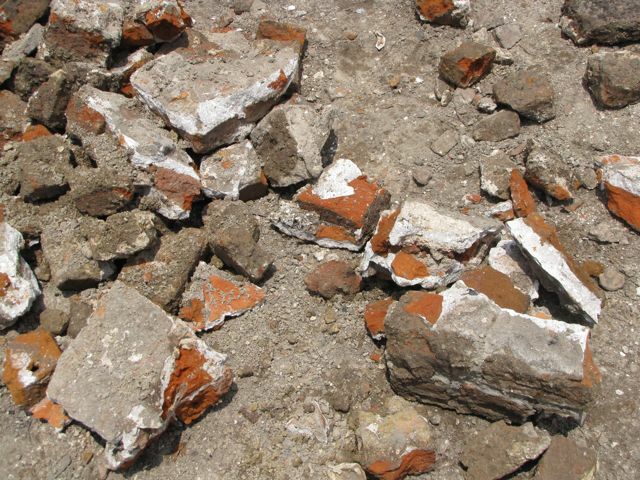 The photograph below left shows a typical collection of this material after it has been removed from the excavation unit. Fragments of old ceramics continue to turn up everywhere. 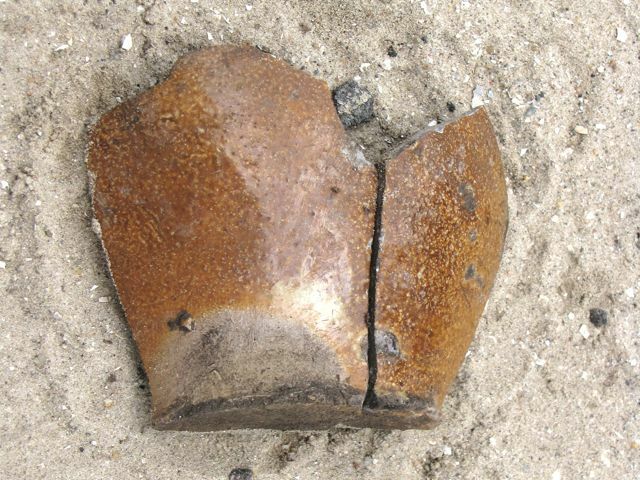 At center above is a portion of a brown salt-glazed stoneware vessel found today. Sherds of this distinctive ceramic type have been plentiful this month. Above right is the highlight of the day, and perhaps the oldest artifact yet found during the current excavation. The archaeologists tell me that this fragment, representing part of the base of a large vessel, is an example of North Devon gravel-tempered ware. 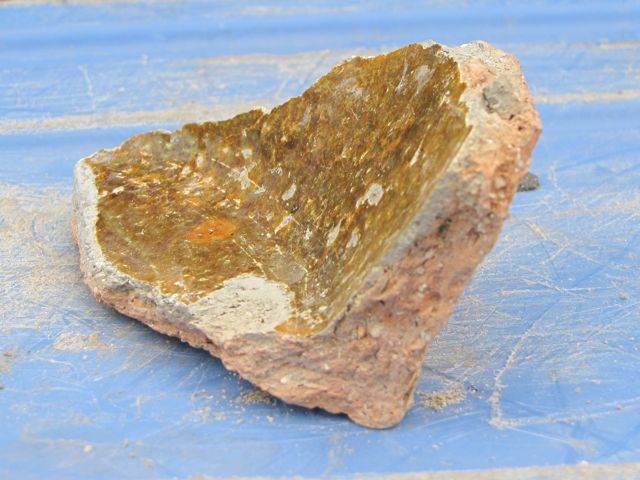 On close inspection of the cross-section of the sherd, you can see tiny pieces of gravel in the composition of the clay. Manufacture of this type of ceramic began in North Devon, England, in the early seventeenth-century, so it’s possible that this vessel may have been brought to Charleston shortly after the town was settled in the late 1600s.